The modern technique of cataract surgery involves removing the cloudy contents of the eye's natural lens, while leaving the clear outer membrane (called the capsule) to hold the new intraocular lens in place. This capsule has cells on it which will, in some cases, continue to produce lens fibers. These fibers cannot be laid down in an organized manner and will form little beads or "pearls" on the lens capsule, forming a secondary membrane. When these pearls accumulate in the pupil, they cause a blurring of vision similar to that which one experiences with a cataract. This occurs approximately 30-40% of the time and can appear at any time after surgery, even as much as five or more years later. Although the blurred vision produced by this membrane can be quite significant, fortunately, there is a very easy way of clearing the pupil of this cloudy capsule. 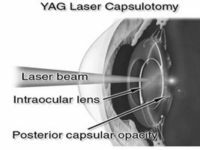 During the procedure, called YAG Laser Capsulotomy , a special laser (Yttrium Aluminum Garnet) is used There is absolutely no pain involved in this procedure and patients can resume their normal activities immediately. The patient will usually notice an improvement as soon as the pupil, which is dilated, goes back to its normal size. Does not involve any anesthesia. Does not require any preoperative tests. Does not need an operating room. Does not have any postoperative restrictions.